This is a question we are often asked by customers in relation to almost all of our products. The answer, of course, is: “It depends”. The quality of the fiber. The simplest constraint on transmission distance is the loss budget: in the most basic case you simply divide the difference between transmit power and receiver sensitivity by the fiber loss per kilometer at the system’s operating wavelength and that is your answer. For example, an OSD139 RS232 modem couples at least -25dBm at a wavelength of 850nm into 62.5/125um multimode fiber and the distant OSD139’s receiver will have a minimum sensitivity of -47dBm. The loss budget is the difference, ie 22dB, which when divided by the worst case fiber loss of 3.5dB/km suggests the system will operate over at least 6.3km. The singlemode version of the OSD139 also has a loss budget of 22dB but at a wavelength of 1310nm (where the fiber loss is less than 0.4dB/km) so it can operate over at least 50km. Any sensible design will also take into account any connectors and splices along the way (eg at patchpanels) as well as allow for a link margin that is chosen partly because of intrinsic mechanisms such as degradation of optical output with time and temperature and partly because of site conditions. Typically, such margins can vary between 3dB and 6dB. In some extreme situations OSD has even allowed for as much as 10dB when it was feared that the optical cable would get damaged fairly regularly so that the splices needed for the repairs would slowly eat away at the margin. However, transmission limitations caused by fiber bandwidth issues are often a far more critical issue and generally do not seem to be well understood by many users. It is useful to review these issues separately for multimode and singlemode fibers as the mechanisms are quite different. Before we start, it is probably worthwhile to briefly review the term “bandwidth”. The bandwidth of a communications medium (like fiber or copper cable) is the range of frequencies that can be transmitted through it. A typical telephone call requires about 3000 Hertz (3kHz) in order to transmit the most important freqencies in human speech. If you want high quality you will extend this to cover all frequencies human hearing can handle, ie to about 20kHz. And if this is to be extended so that television images can be included as well then this is increased to about 5 or 6MHz. Older fiber optic systems transmit audio and video in a simple “Amplitude Modulation” (AM) format which only needs this base bandwidth. However, nowadays almost all modern communications are digital in nature and this can dramatically increase the bandwidth requirements. For example, it is quite common to digitally encode and transmit video signals at speeds of up to 400Mbps for standard definition television (a lot more for High Definition). Such a data rate requires a transmission channel that has a bandwidth of at least 250MHz. And, despite what many people think and as indicated above, optical fibers do actually have bandwidth limitations. Multimode fibers are so-named because they allow many ray paths of light to travel through their core region, something like several hundred distinct paths (or “modes”) in a typical 62.5/125 multimode fiber and the time light takes to travel along all these ray paths will vary slightly with each path (see figure 1 below). These slight propagation delay variations are equivalent to a reduction in the fiber’s transmission bandwidth. A good multimode fiber optimised for operation at 1300nm might have a dispersion of 0.3 to 0.8ns over 1km which very roughly corresponds to an achievable system bandwidth of from 1GHz to 400MHz. While 400MHz can theoretically support as many as 80 AM video channels it would only be enough for just a few uncompressed digital channels. Unfortunately, the fiber dispersion increases with increasing distance. A worst case assumption would be that it increases linearly with distance but in practice it increases roughly to the 0.75 power of distance or, put another way, the bandwidth reduces to the 0.75 power of distance. So our example multimode fiber might be 400MHz over 1km but would reduce to about 120MHz over 5km: not all that useful for many high data rate applications such as uncompressed digital video. There are many other related issues that affect the usable capacity of a multimode fiber but this simple example does illustrate a stark reality of modern uncompressed digital systems: they are really quite limited when it comes to multimode fiber. Of course, when a video codec is used to encode the video using a compression standard such as MPEG4, MJPEG2000, H.264 or several other techniques the transmission bandwidth is reduced dramatically to anything from less than 100kbps (slow frame rates and/or poor quality) to greater than 10Mbps (standard frame rates and high quality image) so such systems which typically use an Ethernet network to transport them between source and user(s) are really only affected if the Ethernet network itself suffers from some sort of congestion. All fiber types are affected by bandwidth limitations caused by the interaction between the transmitting device (Light Emitting Diode (LED) or one of two main types of laser) and the material used in the fiber. The speed of light within a material depends on both the refractive index and the actual wavelength being transmitted. Optical devices actually transmit a narrow range of wavelengths and it is this range of wavelengths (or spectral width) which results in this “chromatic dispersion” (see figure 2 below) and this ranges from <3ps/nm of spectral width/km at 1310nm to 17ps/nm of spectral width/km at 1550nm. While this can be a major problem in higher speed multimode systems it is the main bandwidth limitation in singlemode systems. (There is also a minor limitation called waveguide dispersion which can actually cancel chromatic dispersion at just one specific wavelength). If the laser used to transmit the signal was a perfect single frequency then it would have an extremely high bandwidth distance product allowing transmission of data rates in excess of 10Gbps over hundreds of kilometers at any wavelength. However, as noted above, commercially available devices are not so perfect and actually transmit energy over a narrow range of wavelengths. For example, LEDs mostly used in multimode systems can have from 20nm to 100nm, the low cost lasers typically used in short distance systems are usually the Fabry Perot (FP) type and have a lasing spectrum of 2 to 5nm whereas the higher performance Distributed Feedback (DFB) types used in telecommunications and other long distance systems will normally have a spectrum from 0.02 to 0.1nm. Guess which is the most expensive! 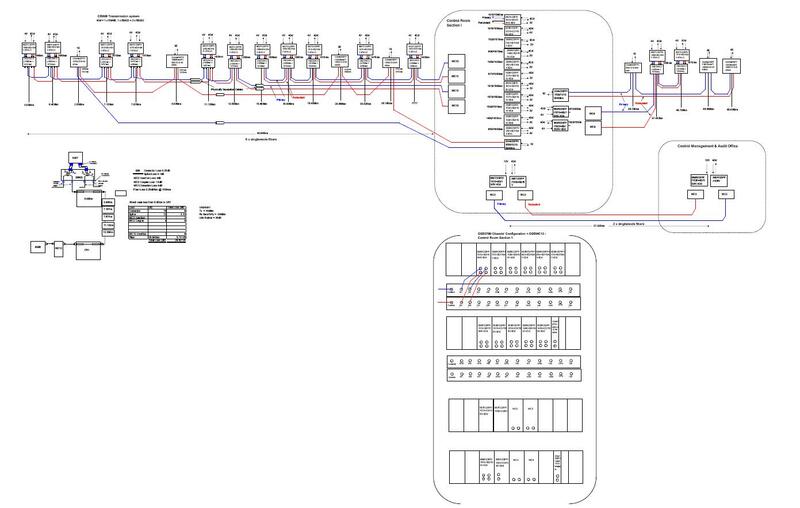 To illustrate what is achievable with a typical high quality digital product let’s look at the OSD8600 4-channel video multiplexer. This unit transmits at an optical data rate of 900Mbps which means it needs around 500MHz system bandwidth. Multimode systems using standard FDDI grade fiber will support this to at least 1km. 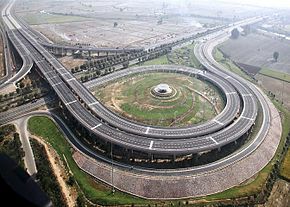 In reality, almost all modern fibers are much better than this and operation over 2km is usually achievable. However, we at OSD are very conservative and would suggest that you not use the product over much more than 1km. Now look at the same product on singlemode fiber. If operating with an FP laser at 1310nm the chromatic dispersion induced bandwidth may be as low as 30GHz.km so this will limit operation to 60km. At 1310nm this corresponds to 20 to 24dB of optical loss which is greater than the 15dB available with the OSD8600’s usual optical devices: typically these are good for a loss budget of 15db which corresponds to around 30 to 40km assuming a loss of 0.4dB/km at 1310nm, less if a link margin is included. On the other hand, at 1550nm the fiber bandwidth with an FP laser will be closer to 4GHz.km which would allow distances of less than 8km. So to take advantage of fiber’s low loss at 1550nm we need to use a DFB laser. This leads to a bandwidth of about 170GHz.km so we are now fiber bandwidth limited to possibly 300km. Given that our best combination of laser and receiving devices would be good for about 37dB at 1550nm we can see that our maximum achievable distance is closer to 180km, assuming a loss of 0.2dB/km at 1550nm. While none of this is rocket science it is commonsense for anyone looking at doing anything out of the ordinary to be aware of the fundamental limitations of fibers and of some of the techniques used by companies like OSD to fully exploit the technology. Please don’t hesitate to contact OSD’s system engineers for any further information or for any assistance in estimating…………. how far can you go. CCTV has traditionally used analog transmission to move pictures from cameras to displays. Currently, this technology is slowly succumbing to IP oriented technology although analog-like SDI uncompressed digital systems are gaining traction in some specialised applications. In all cases, copper based technology has limitations in terms of distance and interference immunity so that fiber is often the preferred, sometimes the only, way of distributing signals around CCTV networks. In this technical corner will discuss fiber optics in CCTV the best ways to make effective use of the technologies now available. Over the past 10 to 15 years CCTV has become ubiquitous and while many applications are related to security almost as many are related to operational and safety matters. For example, road operators have been using CCTV for well over 30 years for monitoring traffic flows in many cities and large towns with fiber first being used in this application well over 20 years ago. Until fairly recently, CCTV used technical standards derived from broadcast television and characterising quality performance of systems likewise derived from the techniques and equipment typically used in the broadcast industry. The advent of IP based CCTV and newer technologies related to High Definition (HD) TV have considerably widened the scope of surveillance systems. Consequently, we now see a mix of both analog based and network based technologies, the former using coaxial cable and the latter using Unshielded Twisted Pair (UTP) cable, typically so-called Cat-5 cable. Often it can be inconvenient to install coax cable and if UTP is available then there is a great incentive to use it. However, similar issues arise when trying to use UTP cables to transmit analog video signals. Typically, passive or active Balanced-to-Unbalanced converters (Baluns) are used and these can provide reasonable transmission over a few hundred meters (even more with active cable equalisation). The Ethernet systems typically deployed in local area networks are often used to transfer IP based video signals but as with coax and balun based analog systems, these also have severe distance limitations and are susceptible to EMC issues. We have spent some time in past issues discussing optical fiber, how it works and the technical parameters of singlemode and multimode fiber so we will not go into all of it here. Please see Technote – ‘Fiber types and using them effectively’ and ‘Singlemode vs Multimode’. Over the past 15 years CCTV technology has slowly moved from the original broadcast industry analog technology based on coaxial cable to systems in which the video is digitized, compressed and transmitted via local network technologies, typically using Ethernet running Internet Protocol (IP) over UTP cabling. The digitization and compression may occur within the camera or externally in a local video encoder or perhaps back at the control room within a DVR. The quality of IP cameras and the schemes used to compress and transmit the video signals has improved dramatically over the past few years but it is still the case that almost all the highest quality cameras are analog output types. Due to this and the (for now) lower cost of analog cameras as compared to equivalent quality IP cameras, analog systems are still popular for general use while in specific applications such as highway or tunnel traffic monitoring many systems engineers are still specifying analog units for reasons such as video quality, zero latency and ease of control. A further “back to the future” wrinkle on this progression has been the application of the broadcast industry’s SDI (Serial Digital Interface) technology to high end CCTV systems over the past few years. The first commercially available fiber CCTV systems were AM. They offer good video performance over several km but the signal does degrade with distance. This technology is still widely used for simple video only links on multimode fiber where it very economically provides more than adequate performance. FM systems came next and overall technical specs are usually better than AM, they tend to have more constant performance with distance and they operate happily over both MM and SM fibers. Finally, uncompressed digital systems can have very high performance which does not change with distance (until it falls off a cliff) and is probably best with SM but is also commonly used with MM. Pricing does increase a little going from AM to FM to digital but not excessively. For example, Figure 1 shows two small transmitter modules that plug onto the camera: the AM unit retails for less than $100 whereas the digital equivalent is about 30 to 50% more expensive. Of course, the digital’s performance is vastly superior! A key issue in this improvement in technology from AM to FM to digital is that the bandwidth requirements do increase fairly dramatically . An AM system needs just the video bandwidth, ie 5 to 10MHz which means that with standard 500MHz.km MM fiber operation over about 100km might be possible if it wasn’t for the fiber attenuation. A basic FM system will require 30 to 50MHz so can operate over around 10km of MM. On the other hand, digital systems operate at bit rates somewhere between 100Mbps (very basic 8-bit systems) to over 350Mbps (high end) which means optical bandwidths of 90 to 300MHz are needed. Therefore, it is difficult to be able to guarantee reliable operation over much more than a few km on MM fiber for most such products. Consequently, digital modems and multiplexers are best suited to SM fiber. For more on fiber bandwidth issues see Tech Corner “How far can you go?”. The transmission rate has been choked in order to allow the network to breathe a little, which typically results in noise, blockiness, reduced frame rates and excessive latency. All these issues are being addressed by system vendors so that excellent quality is now possible, provided the network can handle the increased data rates required for high quality equipment and software. For Standard Definition (SD) video this could be an average of 0.3 to 1.0Mbps with peaks of 10Mbps or even greater. However, megapixel cameras can increase this dramatically with average rates of 5 to 10Mbps for some types. Most networks will operate at 100Mbps out of the camera or encoder and feed either directly to a switch located in a central equipment room or to that switch via a backbone network. This backbone will sometimes be 100Mbps but more usually it will be Gigabit Ethernet such as the redundant ring network shown in Figure 2. Clearly the number of megapixel cameras that can be supported on any network will be a lot less than is possible with standard cameras. Alternatively, larger networks may need to move towards 10Gbps backbone technology. Most legacy fiber has been supplied to meet the old FDDI specification (Fiber Distributed Data Interface, an old standard for token ring based backbone networks) and is usually known as OM1. This is 62.5/125um and has serious limitations in terms of fiber bandwidth, ie 160MHz.km @ 850nm and 500MHz.km @ 1300nm. This is fine if you are running Fast Ethernet over a few kilometers but starts looking a bit shaky once you have Gigabit speeds and really problematical once we are talking 10Gbps. Operation at 1300nm over multimode fiber is sometimes needed, eg when using SM oriented equipment and some care is needed to ensure reliable operation. We have covered some of the issues in Tech corner that can arise in such situations and the consequent need for Mode Conditioning Patchcords (MCP). Of course the other solution to the limitations of MM fibers is just to completely replace them with singlemode fiber and singlemode equipment. This enables you to move seamlessly from generation to generation of technology without touching your network backbone cabling. In fact, to be absolutely sure that your infrastructure does not need any upgrading, also install APC (Angled Physical Contact) connectors on all your new SM fiber with all the benefits APC technology gives you. 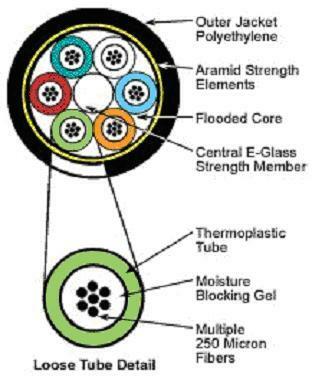 In Technote, “Selection of Optical connectors” goes into some detail on the different connector types and their features. Given the enormous emphasis placed on IP systems by vendors, consultants and end users over the past several years it would be reasonable to assume that this is the ultimate technology for CCTV. Both the original analog technology and then compressed digital technology on which IP systems are based came out of the broadcast industry. Now another broadcast originated system is being applied to CCTV: Serial Digital Interface (SDI). This is a series of standards that started with uncompressed Standard Definition (SD) video running at 270Mbps over coaxial cable and which is also now available for High Definition (HD) at 1485Mbps and at 2970Mbps. It is very likely that the next SDI standard will operate at around 10Gbps. The great thing about SDI is that it is about as pure a digital video signal as it is possible to get so that with good cameras, lenses and transmission technology there are very few impairments in the pictures. Thus, for a minority of higher end CCTV applications it is a very useful technique. An example might be where centralised video analytics are being used in high risk sites such as airports where there is little margin for the distortion and noise that might accompany even high quality IP systems. In some ways the SDI solution looks like an analog solution: camera, 75Ω coaxial cable and BNC connectors and can, theoretically, use the same copper cabling infrastructure already in place for conventional analog CCTV. There are now many surveillance oriented cameras that have a native HD-SDI (1.485Gbps) or 3G-SDI (2.97Gbps) interface. Unfortunately, the distance these systems can transmit over the coaxial cable is somewhat limited: from 140 or so meters using HD-SDI, to as little as 70 metres using 3G-SDI – somewhat similar to the old analog technology. In fact, this compatibility with existing coaxial cable infrastructure is often touted as the key motivation for the move to HD-SDI technology: just replace your cameras and a few components at the control center and “Bingo” – HD zero latency images without the hassle of an IP network. Note also that these numbers assume good quality coaxial cable: attempting to make SDI work with rubbish cable is contra-indicated. Such transmission distances are too short to be practical in many CCTV networks, so fibre optic systems are often essential and a growing range of SDI products is available for the CCTV industry. 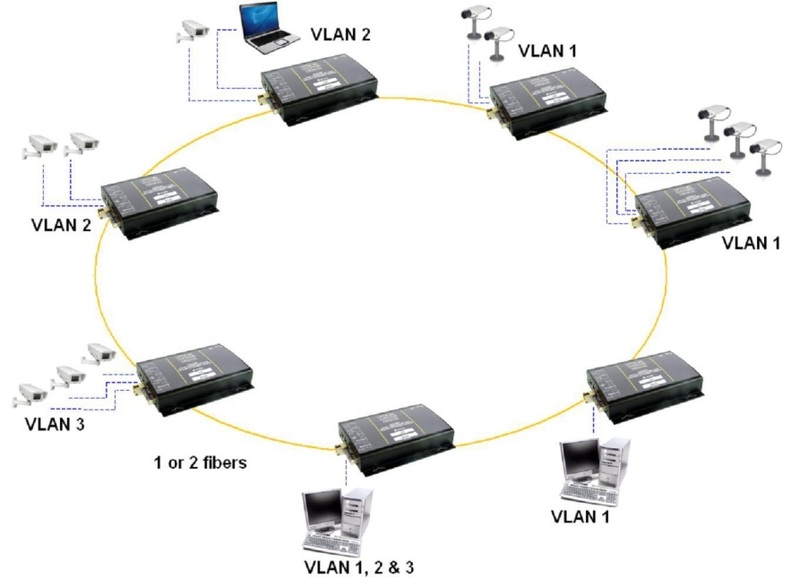 It is certainly best to use SM fiber with these systems but operation with MM fiber is often practical, although it may be necessary to use MCPs. There are many different cable types which tend to be divided into those most suitable for either indoor and outdoor deployment. Most cables used in conventional commercial or industrial outdoor sites do not move once installed so designs such as the loose tube are ideal. Figure 3 illustrates the cross section of a 6-tube design. It has great flexibility in that the individual tubes can each carry from 1 to 12 individual fibers or, in some designs, from 1 to 6 or more 12-fiber ribbons. The cable’s central strength member will usually be dielectric (for example, fiber reinforced plastic, FRP) but can also be metallic. The FRP core is usually quite stiff so bending radii of 500mm or so are quite common which means that this design is not so suitable for in building use where a fair degree of flexibiliity is needed. Some sort of filling is often used inside the tubes to prevent water migration up the cable. Such fillings can be gels or dry powder that expands in contact with water. Distribution (or riser) cables used within buildings need to be flexible, strong and must often meet stringent requirements such as low smoke, zero halogen flame and flame retardancy. The most common design is the tight buffer illustrated in Figure 4. Usually, cables are terminated in Fiber Optic Breakout Trays (FOBOTs) with the terminated trunk fiber appearing via a through adapter (SC in most Australian installations). Connection to the equipment is via a patchcord which will be SC at the FOBOT end and commonly ST, SC or LC at the equipment end. 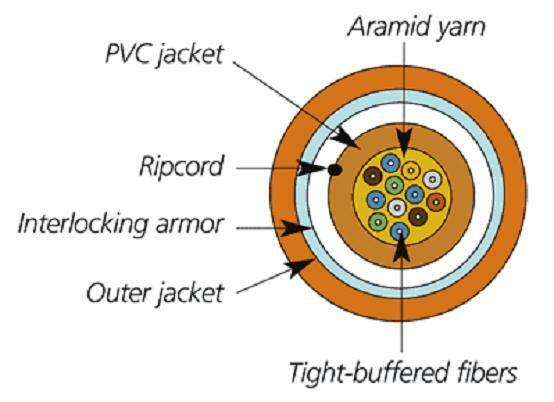 This was earlier discussed in detail in Tech Corner – “The selection of optical connectors”. When a cable is installed and terminated the installer will normally test his work. This should include loss measurements using a power source and an optical power meter and very often will include bothway OTDR (Optical Time Domain Reflectometer) measurements which give a very good picture of the loss of all components of the cabling: cable(s), connectors and splices. Such “certification” is highly recommended in all but the most straightforward installations as it not only establishes the real loss performance on Day One but gives you a reference for any future issues that might arise. Do note that all such OTDR measurements should be carried out at both 850 and 1300nm for MM and at 1300 and 1550nm for SM. Good results on a SM link at 1300nm do not guarantee good results at 1550nm: small imperfections in fiber handling that barely affect SM fiber at 1300nm can cause major problems at 1550nm. After the link has been installed and the fiber installation specialist has been long gone what do you do if you have a problem with the system? The first and most obvious action is to check if the fibers are still working correctly. Many transmission equipments will have some sort of indicator for the received optical signal: it may be a simple “OK/NOT OK” LED on the front panel or it may be embedded in the GUI software and actually show the received optical power level. Or, you may have nothing obvious to look at. We would strongly recommend to anyone with more than a few fiber links in their plant or network or to anyone involved in installing fiber systems that they consider buying a simple low cost (less than $800) optical power meter: it is a great investment which can save you a lot of wasted time. With an optical power meter you can measure the output of transmitters, check receiver sensitivity and overload problems and measure the optical loss of cables, connectors and splices. A power meter is all that’s needed for 90% of organisations. A visual fault indicator which injects intense red light into the fiber is also handy for identifying breaks or fractures in fibers up to hundreds of meters away. Of course, if your operation cannot tolerate any downtime at all and/or you are in a remote area then an OTDR and fusion splicer might also be advisable. Fiber is a well established technology that can offer enormous benefits to end users in enabling interference free transmission over almost any distance of high quality video, whether it be in analog, IP or SDI formats. The fiber type used will often have been already decided due to factors outside the user’s control but if not it is recommended that singlemode be looked at very seriously. Using APC style connectors for such SM infrastructure is also recommended. Factors such as the type of cable to be used will be determined by site conditions, eg typically loose tube types for the longer outdoor runs and tight buffer (aka distribution) within buildings. It is always recommended to use FOBOTs to interface between the cabling and the equipment. Various standards either recommend or mandate the use of the SC type connector for this building cabling but please note that the standards do not specify which connectors should be used on the transmission equipment: this is up to the manufacturer. Consequently, much use is made of patchcords with an SC on the FOBOT end and an ST or LC or whatever on the equipment end. It is recommended that OTDR based testing of new installations other than the most simple be carried out and a record kept of these results. It is also suggested that an optical power meter be readily available for quick checks in case of any issues. Given the enormous emphasis placed on IP systems by vendors, consultants and end users over the past several years it would be reasonable to assume that this is the ultimate technology for CCTV. Both the original analog technology and then compressed digital technology on which IP systems are ultimately based came out of the broadcast industry. Now another broadcast industry originated system is being applied to CCTV: Serial Digital Interface (SDI). This is a series of standards developed by the Society of Motion Picture and Television Engineers (SMPTE) that started many years ago with uncompressed Standard Definition (SD) video running at 270Mbps over coaxial cable. This was extended so that it is also now available at a variety of data rates the most important of which for CCTV applications are High Definition (HD) at 1485Mbps and at 2970Mbps. And, it is very likely that the next SDI standard will operate at around 10Gbps. All SDI digital signals operate at a peak to peak voltage level of 800mV ±10% over 75Ω coaxial cable and employ BNC connectors. It is possible with high quality coaxial cable to transmit reliably over at least 400 meters at 270Mbps, 220 meters at 1485Mbps and 200 meters at 2970Mbps, roughly comparable to what is attainable with analog signal transmission over coaxial cable. Note however that achieving these sorts of distances does assume good quality coaxial cable: attempting to make SDI work over significant distances with some of the cheap cable sometimes used in CCTV installations is not a good idea.The great technical feature of SDI is that it is about as pure a digital video signal as it is possible to get so that with good cameras, lenses and transmission technology there are very few impairments in the pictures with the actual source picture being delivered across the SDI link unaltered. Thus, for some higher end CCTV applications it is a very useful technique. An example might be where centralised video analytics are being used in high risk sites such as airports where there is little margin for the distortion and noise that might accompany even high quality IP systems.Other attractive features of HD-SDI are:There are no network issues to worry about so that it is easily installed and commissioned by non-IT installers and technicians. There is no transmission delay (i.e. latency) so camera control is as easy as for analog cameras. In some ways the SDI solution looks like an analog solution and as already noted can often use the same copper cabling infrastructure already in place for conventional analog CCTV. There are now many surveillance oriented cameras that have a native HD-SDI (1.485Gbps) or 3G-SDI (2.97Gbps) interface. Of course, distances of around 100 to 200 meters are too short to be practical in many CCTV networks, so fiber optic transmission systems are often essential and there is a growing range of SDI fiber products available for the CCTV industry. It is certainly best to use singlemode fiber with these systems but operation over limited lengths of multimode fiber (eg, 300 meters at 3G-SDI) is also possible using optical components operating at 850nm.So, while HD-SDI can offer superb video quality and can be very convenient to install and to use, what are the downsides? This is a DVR so the advantages of NVRs are not possible. Currently, only a restricted number of channels are available compared to the 16 to 64 typical of conventional DVRs and NVRs. The signal gets compressed and the level of compression determines the quality of the recorded image, just as it does in conventional IP systems. Finally, it is important to note that HD-SDI technology is being adapted and customised for CCTV via a consortium of suppliers and users known as the HDcctv Alliance (see www.highdefcctv.org). The Alliance is developing standards for several areas such as the transmission technology itself (based on the broadcast industry’s SMPTE standards) and the transmission and integration of duplex data and audio signals onto the same coaxial cable carrying the HD-SDI signal. In addition, lossless compression techniques (such as Dirac) will probably be incorporated to provide greater transmission distances over standard CCTV quality coaxial cables.As often happens with the introduction of new technologies, there is a fair amount of hype about HD-SDI with some extremely optimistic projections for its take up in the marketplace. The reality is that it does have some very nice features that have appeal for different markets ranging from very high end applications down to retrofits of existing simple analog systems. OSD expects that the trend to IP will continue, particularly in larger systems where the flexibility and built-in redundancy of well designed networked CCTV is of paramount importance, but that HD-SDI provides a very useful option for many applications. 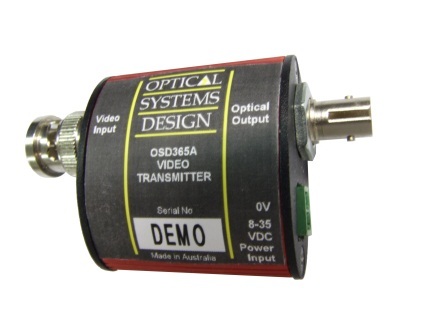 For further information on HD-SDI systems and the options available for optical signal transmission please contact any of OSD’s systems engineers who will be very happy to assist you.